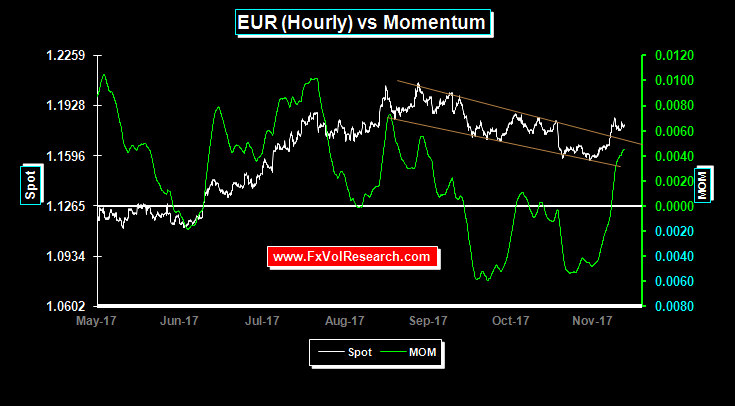 EUR momentum has flipped into positive territory while down channel has been violated. 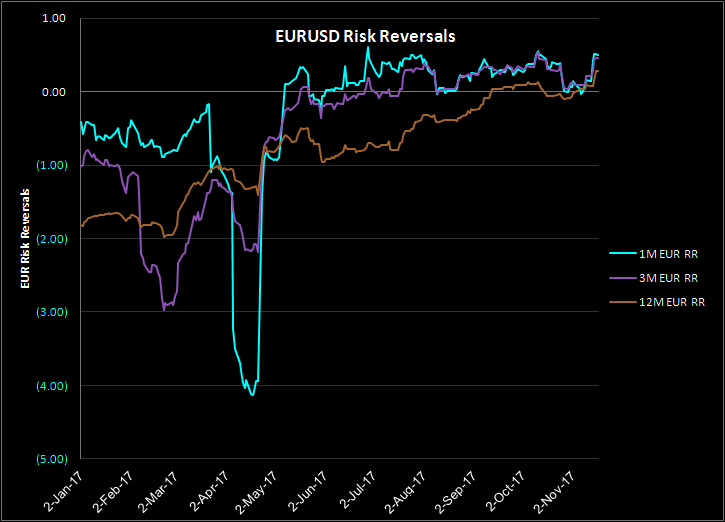 EUR risk reversals have also flipped back in favour of EUR calls trading at a premium to EUR puts. The one-year reversal has made a new high. 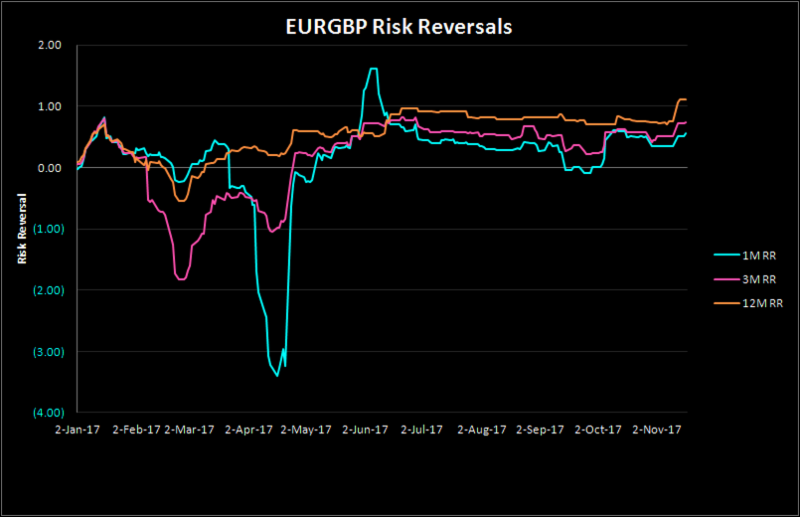 Based on our percentile ranking models the back end of the EUR risk reversal curve is expensive in the sense of EUR calls being overpriced in relation to puts. CHF risk reversals (not shown) are by comparison cheap in the back end of the curve compared to EUR. We pointed out here last week that the one-month EUR vols were cheap in the mid 5% range. 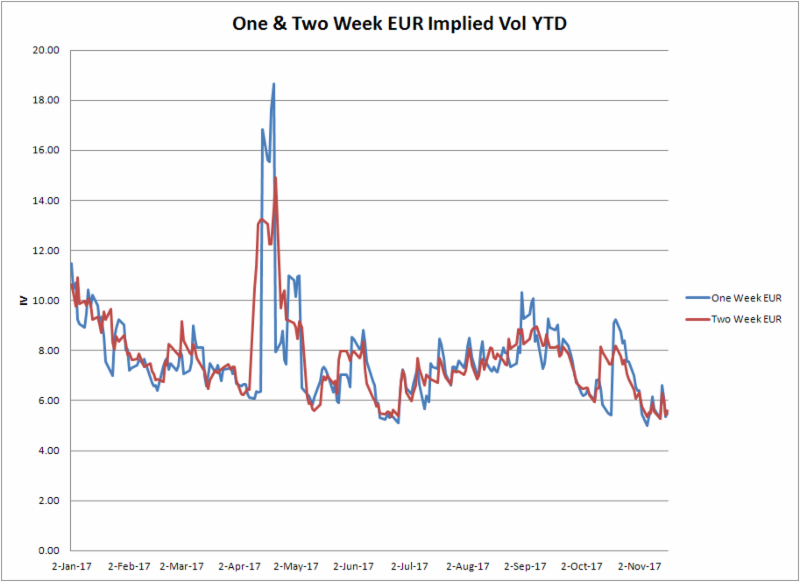 That pricing anomaly has been removed as EUR vols from 1M on out rose slightly last week. The one month is now in the mid 6% range and the rest of the curve from 3M on out moved up by approx 0.2%. The short dates, in particular, the one and two weeks are in our view still too low, with the two weeks being a particularly good value when compared to the recent historicals. If this hols up into Monday’s session, it may well prove a good time to consider 2 weeks 30 delta strangles if the two week ATM vols are in the region of 5.6% mid-market. The options market does not want to be short EUR calls, both vs the Dollar and vs GBP. 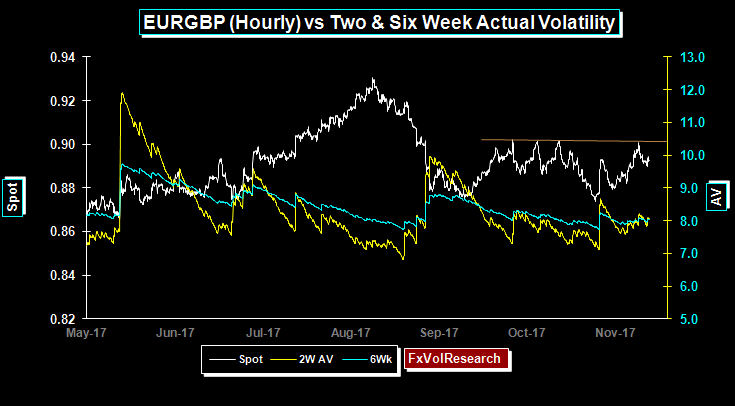 The one-year EURGBP risk reversal made a new high last week. This is despite the price action showing the EUR topping out on multiple occasions in the 9020 area. The hourly EURGBP chart above shows clearly the resistance at 9020 in EURGBP now seen in the quadruple top formation. 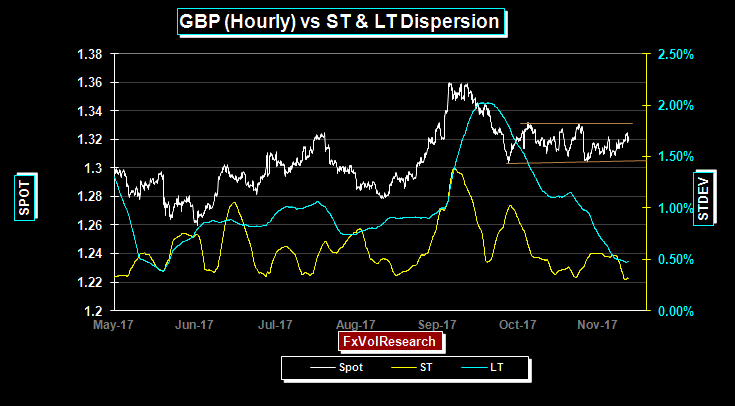 Short term EURGBP actuals in holding stable in the 8% area, neither over nor underpriced in relation to the current premium levels. In fact, one-month EURGBP closed on Friday at 8.05% mid-market. 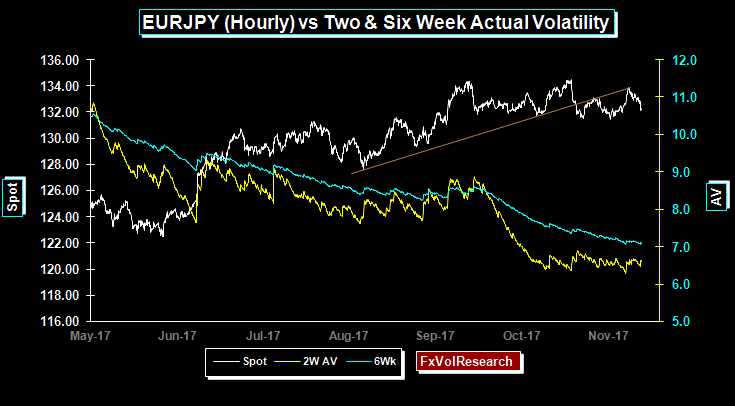 The EURJPY curve remained stable last week with the gap between the 3M and the 6M remaining stable at approx 1%. Our view remains that this gap should narrow and remain of the view that the likely move over the next 3 months will pan out with a lower spot and a higher implied vols. The spot has tried and failed to take out 134 on a number of tries. The spot traded up to the top end of our trend line (in brown) and has since come back down but so far is failing to make a convincing break under 132. Finally, actual vols remain in the holding pattern completely in line with the premiums in the options market but no longer declining. GBP remains in the confines of the channel seen in the chart above. Not surprisingly as the range holds the LT dispersion indicators are declining and close to making an important low. The implication is that the range should give way soon. 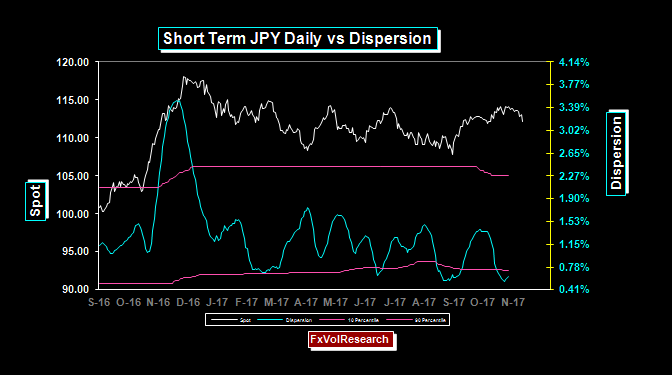 Yen dispersion is also low but now turning up as the spot shows some clearer signs of rolling over. With the yen failing to take out 114 decisively the actual vols are likely to rise on any renewed yen strength. 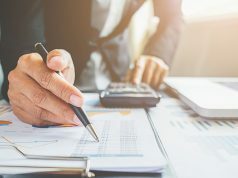 The options market here is not underpriced and both the short dates and the risk reversals are now at levels the move than adequately reflect the potential for a leg down on the dollar. In the daily chart above you can see more clearly the failure of the Yen to sustain level over 114 and the recent break lower. 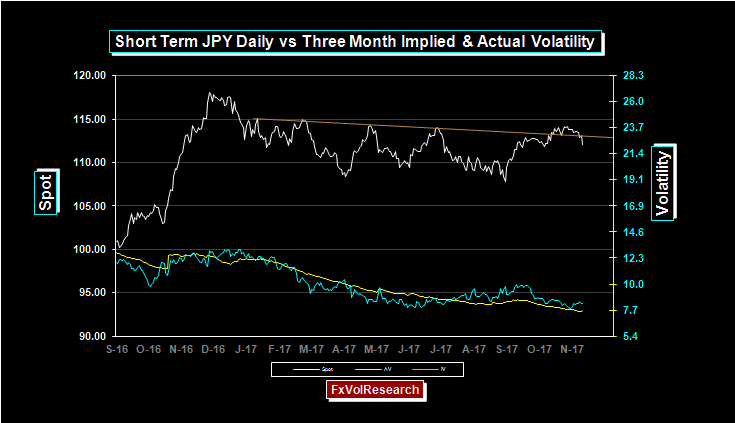 Three-month yen implied volatility has been declining but remains over the historicals. Short-dated yen is the same as the options market overpriced in relation to the recent actuals. 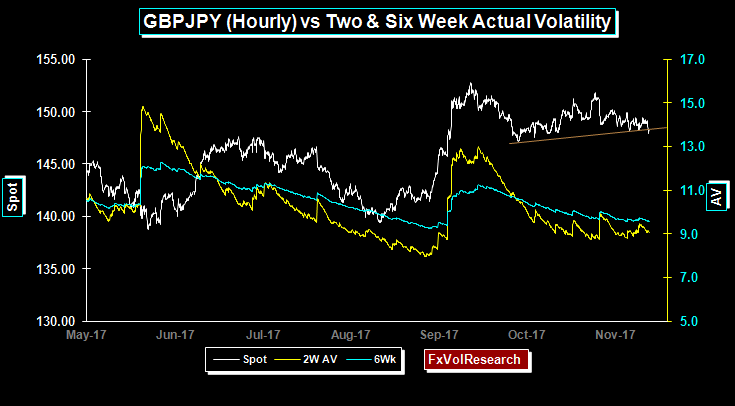 On this basis, we do not see substantial buying opportunities, but better edge to be found using directional Yen call spreads or near-dated yen butterflies. CADJPY continues to drift lower and the failure to trade back above 90 has now led to a more convincing sell off to the 88 level. We remain of the view that there is likely to be a re-rating of the Yen on the crosses, in particular, CADJPY, GBPJPY, and EURJPY. 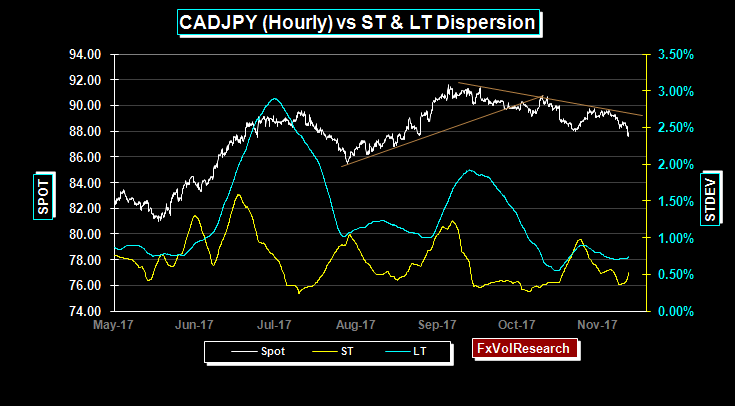 So far we have been mostly right about CADJPY and less so on the others. Low dispersion readings also increase the odds of more near-term trending price action. Three-month USDCAD implied vol tried to break the 6% level but failed. 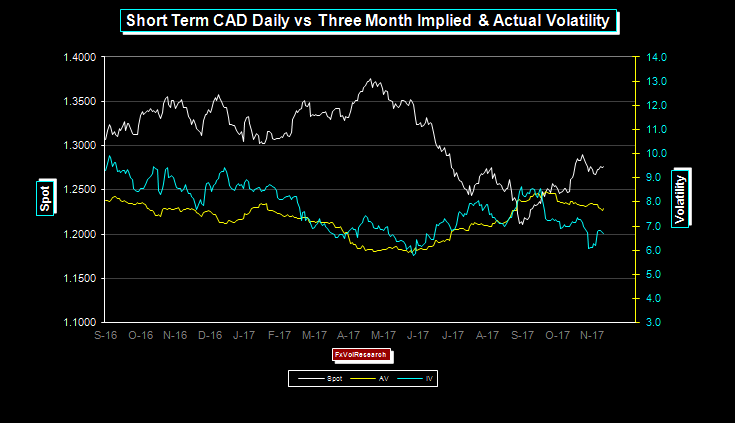 Last week CAD implied vols rose back from their oversold levels and as a consequence, the IV-AV spreads narrowed. 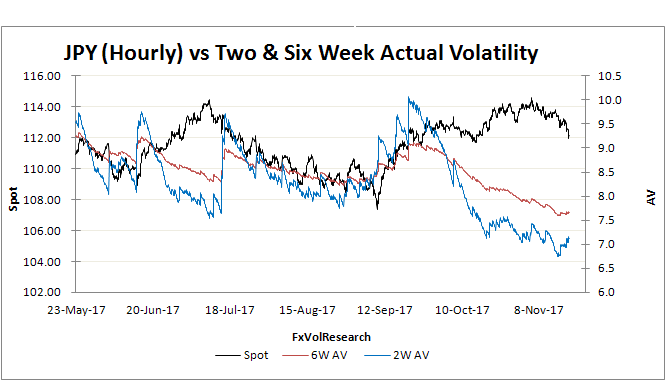 We would continue to see value in covering short vol positions under 6% in the three months periods. The spot remains on track to retest 1.3000 by the end of the year. The Canadian and Australian economies have many similarities. Both are resourced based, both have high levels of private debt, and both are being influenced by inflows of foreign capital. The differences are that the RBA has been reluctant to any near-term monetary tightening. 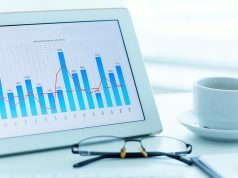 At the same time, there is mounting evidence of the housing market starting to roll over. 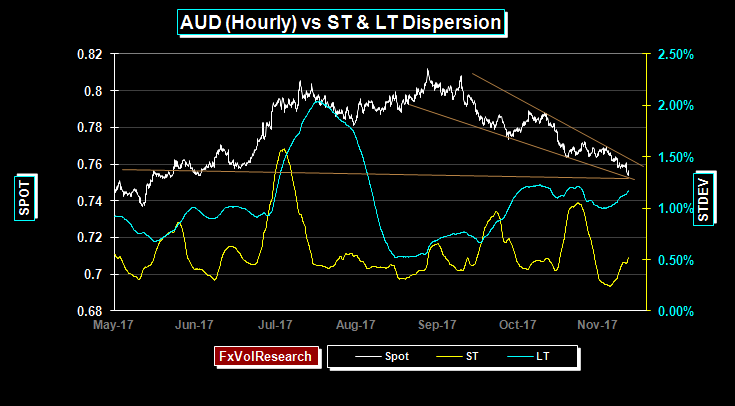 This week we started to see AUD risk reversals move better bid for AUD puts something that normally one would have expected to see earlier in this downtrend. AUD vols stabilized last week and the one year moved back to the 8% level. 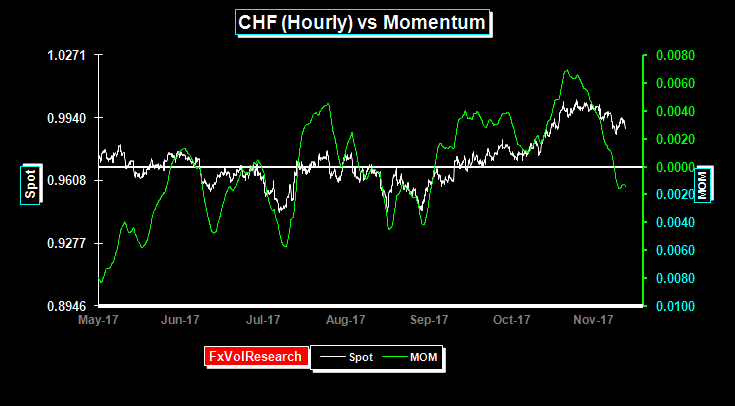 If you are looking for a slow CHF appreciation vs. the Dollar you may want to think about buying a slightly in-the-money CHF call and selling an out-of-the money CHF call. 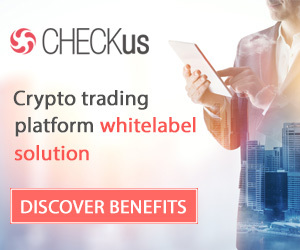 For example buy the three month 9950 strike and sell the 9650 strike. The 147-149 support has to give way in GBPJPY before we can see an acceleration of the JPY rally. The brown line in the chart above marks this support and the very early tentative signs of it being violated. However behind this there is still more support at 147. Once that gives way a larger correction to 140 is much more likely.